At Advanced Dentistry, our Portland, Oregon prosthodontists remain committed to providing patients with the most advanced dental care possible. That’s why Drs. Halmos and Manning continue to utilize the latest equipment available to help ensure that every patient receives the healthier, better looking smile they’ve been dreaming of. It’s because of this commitment that our office uses the 3Shape Trios Intraoral Scanner. A state-of-the-art scanner, Trios technology enables Drs. Halmos and Manning to further enhance our patient experience by eliminating the need for impressions, while also providing the exceptionally detailed information needed to create a customized treatment plan perfect for renovating any smile. 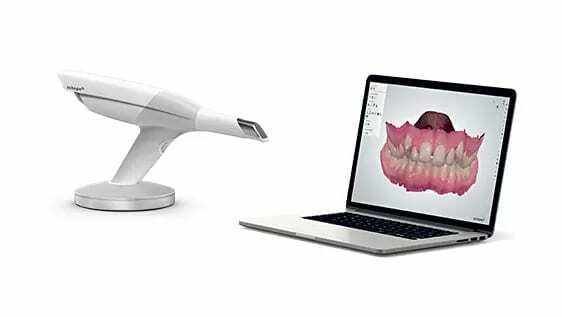 The Trios digital scanner links to highly advanced software that enables our Portland, Oregon prosthodontists to create a custom treatment plan for our patients. This sophisticated scanner works to first capture an incredibly detailed 3D image of the area of a patient’s smile in need of repair. Once the problem area has been captured, our doctors will review the scan to gain a better understanding of the type of restoration required to fix the problem. Next, the scan will be used to create a customized restoration, such as a dental crown, bridge, or dentures. Our lab will create a restoration that’s perfectly sized to fit seamlessly into your natural looking smile. After fabrication is complete, our doctors will place the restoration, thereby completing the treatment and improving the health of a patient’s smile. While this may seem like an incredibly easy and straightforward process, placing a restoration once required the use of X-rays and dental molds that made the experience far less comfortable for patients. Thanks to the 3Shape Trios Intraoral Scanner, achieving a great looking smile for our patients has never been easier for our Portland prosthodontists. Contact our office today to schedule your consultation with Drs. Halmos and Manning and experience for yourself the Advanced Dentistry difference.